FSBO's - love them or hate them, they are a major opportunity for you to grow your real estate business. However, they can be one of the most difficult listings to close because, more often than not, they are stubborn and don't want to pay you to get their house sold. Yet, every day real estate agents and real estate coaches talk about how valuable FSBO's can be and share their new FSBO listings online. Perhaps you look at those listings with envy, wondering how they were able to seal the deal and get that listing. Or maybe you think that you have to spend countless hours laboriously cold calling and door knocking to get FSBO listings. Hint: Neither is true. 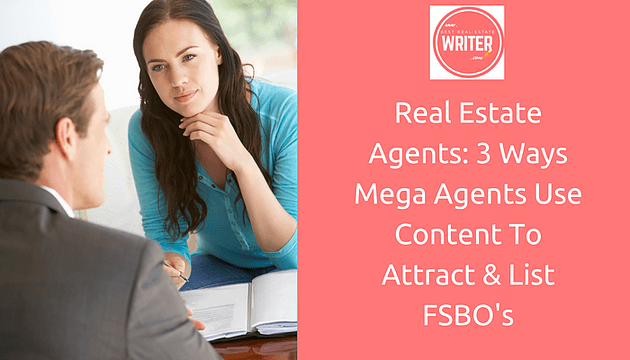 Today, I am going to teach you just how mega agents are attracting those FSBO listings using powerful real estate content that breaks down the FSBO defenses and gets them to trust you enough to sign a listing agreement. Oh, and by the way I DO NOT condone you lowering your commission percentage to get them to list their house with you. Doing that undermines every agent in the industry including yourself and will lead to a permanent discount to the standard 6% that every one of you depends on. It boosts your website's SEO. It opens the door for you to build a trusting relationship with FSBO leads. It begins to position you as an expert in your market. Once you have created your content, you need to take the time to promote it properly across multiple avenues like email and social media. Be sure that you are posting your FSBO content in the places where a FSBO might actually find it like Pinterest boards with tips for FSBO's or Facebook Groups where they share their listings. Once you have attracted a FSBO or prospect to your website or blog and added them to your contact list, you need to start building your relationship with them. This is also done using content that is tailored to appeal to someone that wants to sell their home themselves. The best approach for this is to create a balance between giveaways (like a branded downloadable checklist for preparing your house to be sold) and content that teaches them the value they receive when listing their house with an agent. You are essentially back-door selling them here. Contact Me For More Title & Content Suggestions To Offer FSBO's. Send these content offerings to your prospects via email and spread them on social media as well. When used correctly, these extremely valuable types of content will work for you to attract more leads than you will know what to do with - and that's a fun problem to have! Just like with any listing appointment, you are going to need to prove your worth and value in order to seal the deal. However, with a FSBO's listing appointment, you are likely going to have to work harder at this to really make them understand the value of listing with you. Or are you? Warning: What I am about to tell you to do might sound totally crazy but it has such tremendous value, such insane impact, such hypnotic effects on FSBO's that I urge you to hear me out. If you really want to get more for sale by owner listings, there is one piece of content that you MUST produce: a book. That's right, I want you to write a book (or you can always hire someone to do it for you). After you have toured the property, and made small chat to butter them up, it is time to sit your prospect down and begin your sales pitch. Well I am here to tell you that there is absolutely no better tool you can use to blow prospects away than a branded book with your name on it. Having your own branded book (which you will be giving them of course) will completely change their perception of you! Instantly, you go from some agent trying to steal their equity, to a real estate rock star that they would be lucky to have listing their house for them! It confirms for them that you are the ultimate expert in your field and if they do decide that they are going to list with an agent at any point, that they will do it with you. I know this to be true because I have witnessed it first hand when I released my first book and when I watch real estate agents like yourself sky-rocket their business when with their own books. Over night prospects, friends, and family will look at you in a whole new light when you have a book with your name on it. Having your own branded book will take you from being "just another real estate agent" to an expert, a rock star, a success.